Last week we looked at incorporating heirloom lace and crochet into pottery. This week, in Ms. Jeannie’s unique Holiday Gift guide that aims to combine the old with the new, she is highlighting handwriting and all the magical ways you can incorporate the penmanship of ancestors into a contemporary gift. Everybody who enjoys cooking knows that family recipes are the source of stories and memories just as much as they are the source of good food. If you are looking for a special host or hostess gift for your best gourmet, this one combines a treasured handwritten family recipe with a very useful kitchen apron. This is a gift they can be used every day of the year! Or enlarge an old family land deed or immigration document like these below. 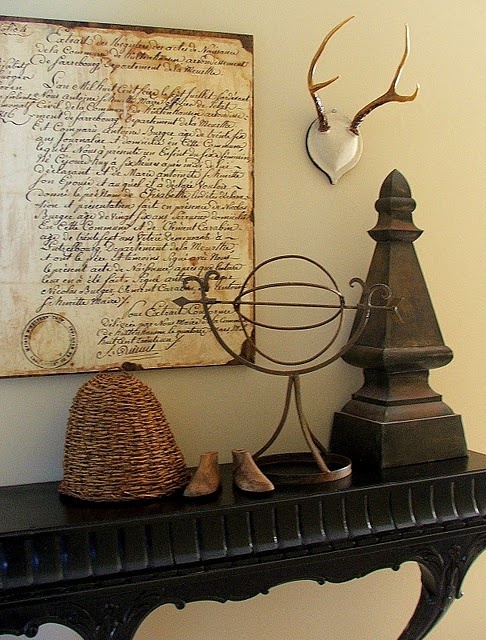 Old plats, sales receipts, contracts and assorted paper ephemera from the 1700’s and 1800’s are gorgeous in all their weathered glory with scripted fonts, aged paper and range of neutral colors. No two look alike! Old documents pertaining to family history can be found online at ancestry.com or on file at local libraries and historical foundations. These make especially great gifts for anyone who has recently moved into a new house, started a new business venture or just needs a little visual reminder that great things are possible. Previous Monday in the Kitchen: It’s Sopa de Fuba Season! These first two ideas have been lovely–and also give me ideas for DIY gifts I could handle!